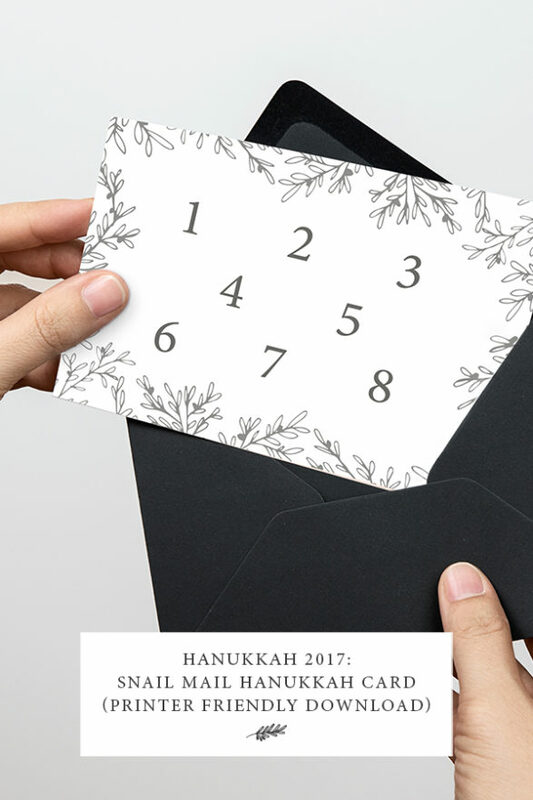 Traditional mail is still a viable way to connect with people, especially during Hanukkah. Snail mail makes us all feel special. Here are three modern and beautiful Hanukkah cards that you can download and print at home or at a print shop. These cards feature a simplistic design with natural elements, to make these cards feel extra special to the recipient. You can print the card on a heavy stock paper or paper with a texture that enhances the design. This Hanukkah card is available for immediate download and comes in a high quality (300 dpi) PDF file for ease of printing. When you download the file you will receive one PDF that contains three Hanukkah illustration cards. This printable Hanukkah card is simple to put together. You can make these alone and also enlist your children to help. Use these cards to wish your family, friends and co-workers “Happy Hanukkah”. You can send these cards via snail mail and/or use them to adorn your presents.